Baseball legend Babe Ruth said, “It is hard to beat the person who never gives up.” It’s a simple statement, but it’s thoughtful and holds a great deal of truth. If you want to reach your goals, you have to stay committed, persevere, and never lose sight of what you’ve set out to achieve. Not only is Babe Ruth’s quote about goal success true of baseball, it’s true off the field in everyday life, too. Here at PSECU, a leading Pennsylvania-based credit union, that goal dates back all the way to our creation more than 80 years ago when our 22 founding members pooled resources in hopes of taking control of their finances to make a better life for themselves and those around them. Our commitment to improving the lives of those within our reach, along with our dedication to the credit union philosophy of “people helping people,” has endured the test of time. Today, they remain as major drivers behind all of our day-to-day activities. 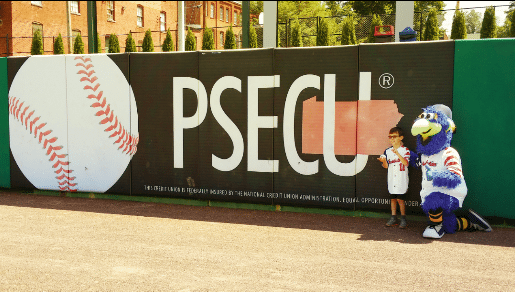 PSECU has never given up on its goals, and we’ve even found a way to incorporate the fun of baseball into some of our community outreach efforts. Following an annual PSECU tradition, we recently kicked off another year of our Minor League Baseball-centered sponsorship of Children’s Miracle Network Hospitals. This summer, we will host Children’s Miracle Network Hospitals children and their families at nine Minor League Baseball games. The experience that we create includes complimentary tickets, pre-game opportunities like stadium tours, and participation in the game’s ceremonial first pitch. Let’s play ball! Additionally, over the course of the summer, we will cumulatively donate more than $16,000 to the CMN Hospitals cause through funds raised through commemorative jersey and memorabilia auctions at the games. Our CMN Hospitals-themed initiative started out small, with involvement of only one Minor League Baseball team – the Harrisburg Senators. Over time, we’ve helped it grow to include several more teams throughout Central and Southcentral Pennsylvania and the state’s Lehigh Valley. Lancaster Barnstormers, Lehigh Valley IronPigs, State College Spikes, Reading Fightin’ Phils and York Revolution are now also in the lineup. Babe Ruth’s words “It is hard to beat the person who never gives up,” ring true at PSECU. We haven’t given up on our commitment to the community, and we don’t plan on backing down from our goal of helping others. We’ll see you at the ball game! Thanks for the great blog post. Sincerely grateful for PSECU’s generosity support over the years.